A parking lot on 21st Avenue South, Lot 7, will close permanently Monday, May 15, as the university begins work on the new 29,947-square-foot addition to the School of Nursing. Lot 7 will be converted to a green space, with a drive that will allow for drop off at the entry of the $23.6 million facility that will be built at the intersection of VUSN’s historic Godchaux Hall and the Patricia Champion Frist Hall near the south side of Heard Library. Zone 2 parking is available in the Wesley Place Garage (spaces 250 and above), as is reserved parking for VUSN visitors and reserved space holders. The five-floor structure will house technologically advanced classrooms, conference and seminar rooms, student services offices, faculty offices and a simulation teaching lab that will allow complex skills development and real-time feedback on students’ clinical nursing skills. The building’s virtual classroom will incorporate leading-edge online and distance technology to facilitate distance learning, and its interactive classroom will facilitate large and small group interactions with electronic methods that allow for sharing of group data and findings. 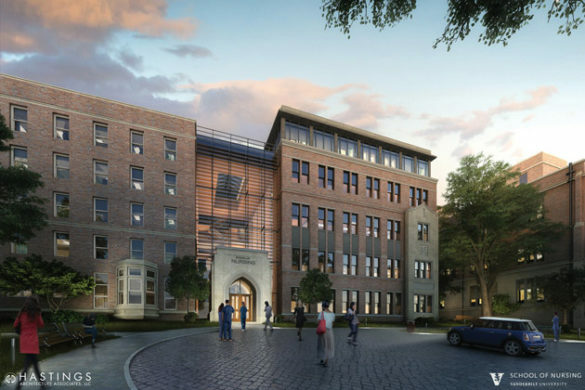 The new addition also will expand the space for teaching and will allow faculty to be located contiguous to the classrooms and labs, and free space in Godchaux Hall will be dedicated to research and research faculty. Sidewalks around the site will remain open, and designated accessible entrances will be provided throughout construction.